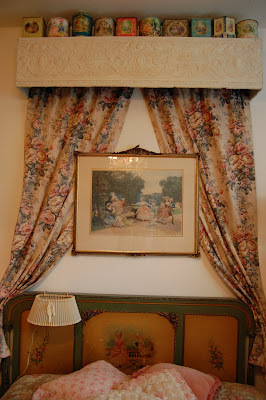 Maison Douce: Where I create ~ a blog party! 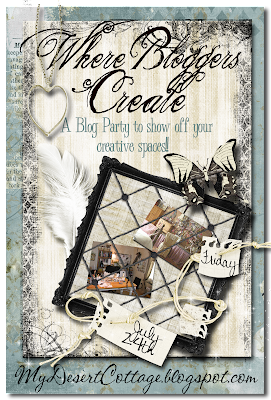 I am so excited to be a part of Karen's "Where Bloggers Create" party!!! 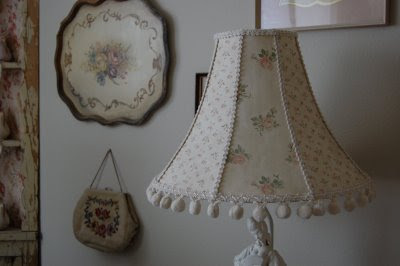 I know some of you may already have seen a post about my little guest/sewing room, but since it's been a while and for those who are new to my blog, I thought it would be safe to post about it again! I can't wait to visit the other blogs as I know I will be tremendously inspired!! Our downstairs guest bedroom/sewing room has seen a few different lives, but this is by far my favorite!! I gave myself carte blanche to go crazy with all my pretties... 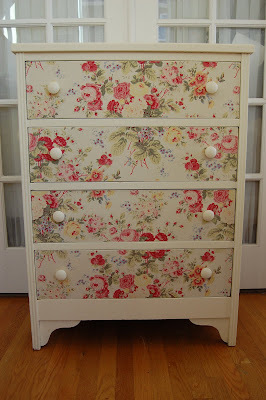 It all started with an antique handpainted french bed that Lisa spotted for me on Craigslist... It set the tone for the entire room. 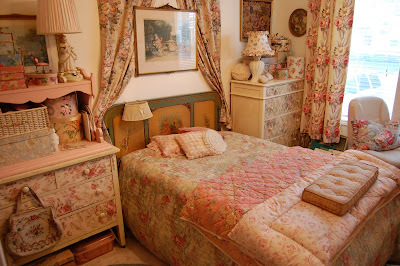 The room, though small, houses some of my favorite items, including my wallpapered dressers and my large collection of vintage barkcloth. Even though I do most of my cutting, stapling and gluing on the kitchen floor (am I the only one??!! 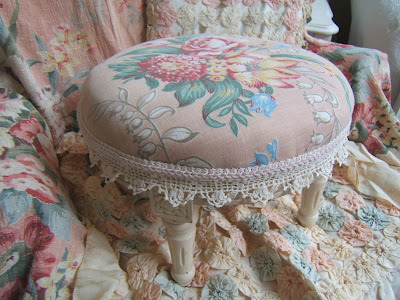 ), this is where I do what I love the most, sewing!! Now, I have to come clean, it doesn't always look this good ~ most often than not, the bed is covered with projects and the floor has pillow forms, bags of fabric and other stuff...!! But, for now, we'll just pretend it looks like this all the time!! Oh, the joys of virtual reality!!! 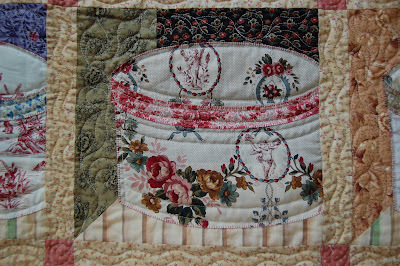 But, slowly, I became passionate about other things, and quilting took a place in the back burner! 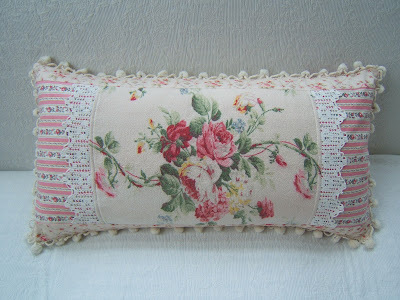 As I started my selling business, I fell in love with using vintage and vintage reproduction fabrics to create pillows, tote bags, stools, etc. 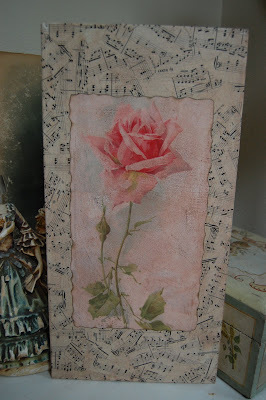 I also started using vintage wallpapers and other ephemera to create one of a kind pieces. Today, my mind wanders constantly and the ideas flow... I love to create, and the true reward is seeing someone enjoying or being inspired by my creations!! I leave you with just a small sample of some of the things I have created in the past... May the ideas never stop flowing! Just as I may inspire you, I always have and always will find inspiration in all of you... !! really really beautiful. I love it! Your space is beautiful...i love flowers...So romantic !!! Oh Isabel, that workplace, your beautiful creations, that ingenious ribbon box...all so wonderful! You are so creative! 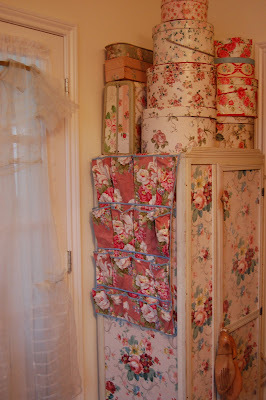 I can't decide what is more beautiful, the dressers with the coordinating containers, the bed, the headboard, the drapes, the CLOSET OF FABRIC, THE QUILTS! 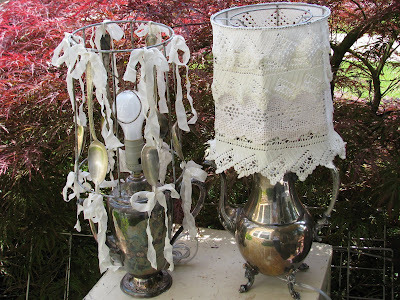 You are amazing talented crafter & thrifter. Thank you for sharing these pictures once again. 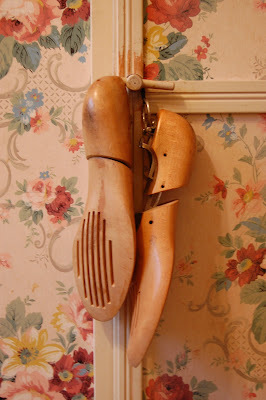 I follow your blog but hadn't seen these before! Have a great weekend! hope you will come visit. oh my goodness, what a BEAUTIFUL post! I love everything in it. 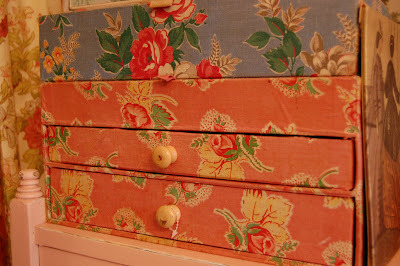 All of your boxes and chest covered in gorgeous fabric and paper are incredible. 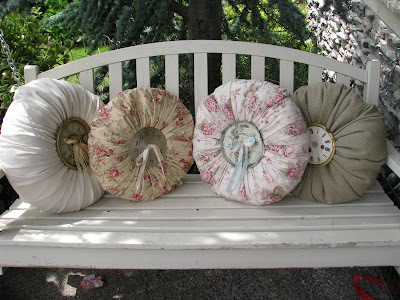 I LOVE those round, gathered pillows, and the lampshades are 2 die 4! Very lucky girl... It's loely. Oh my! Never in one place have I seen so many beautiful fabrics. I could be lost in your room for hours! 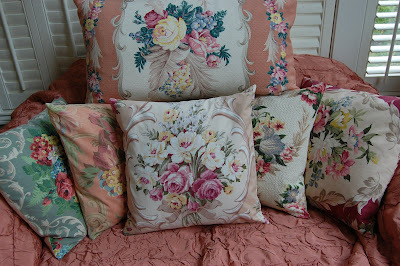 I have loved florals and vintage barkcloth for as long as I can remember. Your quilts are absolutely amazing. Thanks for sharing your wonderful space. Yes, this is what I was hoping for at this event: an enourmous amount of inspiration! I doubted until the very last minute whether I should play along myself, I did and yes my study is always a mess when I'm creating, in fact it is always a mess. And taking projects into other rooms seems familiar to me, and I bet I'm not the only one! I love all that flowery paper. Have a nice day and be inspired too! What a gorgeous room and I LOVE all your beautiful creations!!! Oh Isabel, I love space!!!! 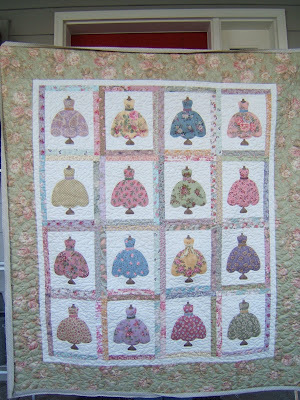 Your quilts are so beautiful, love that pink!!!! I can only imagine how inspiring it must be to create in your space!!!! This is such a lovely way to visit everyone! Love your room for creating. 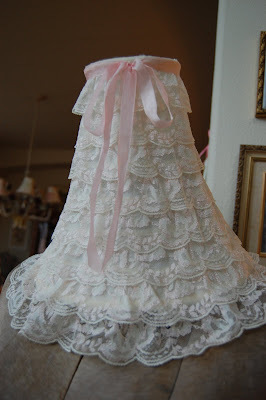 It is so feminine and pretty. I just have 3 words for your space...to DIE for!!! Very lovely indeed! 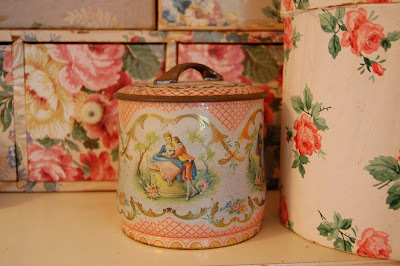 love the tins! I'm glad to see all of this creativity again...inspiring...BTW I'm lovin' my umbrella...haven't found a place for it yet though...too busy doing other stuff. What a lovely retreat! Love the umbrella and the ribbon holder. What kind of sewing machine do you use, I am in the market for one and am asking everyone what they have. How completely gorgeous, every little bit of it!! I love love love your room! Creative people = the most wonderful creative collections!!!! Can I come over and spend the night or maybe two? Lovely and inspirational. Thanks for sharing! Stop by for a visit! What a gorgeous work room!!! I would dare take a picture of mine. It is a total mess. 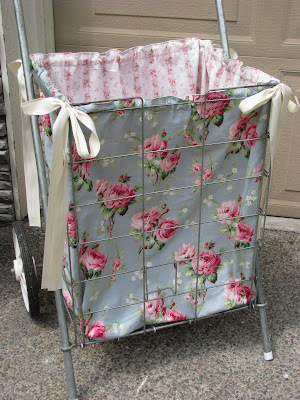 I love the things you create from vintage fabrics! You know what you love and it shows in your creative space and the work that you do. Wow! Simply stunning! You are amazing! 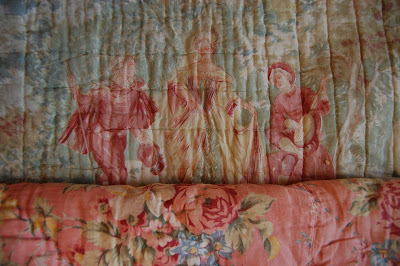 And the room has all of my favorite things: flowers, barkcloth, a sewing machine, pink, beautiful creations --- and that bed! Oh what I would give for that bed! Thank you so much for showing us your space. gorgeous,gorgeous work and pics Isabel! 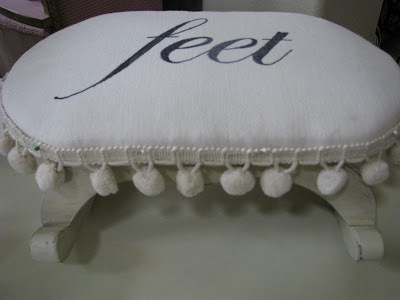 I am speechless..I knew by your blog header that you would have a space that i love!!! 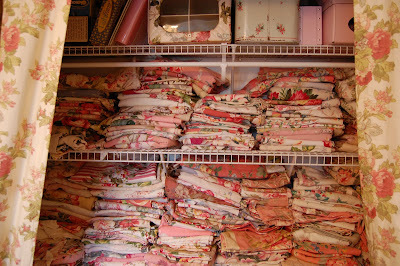 Look at all that fabric...your room is gorgeous!!!!! Oh no wonder you get so many great things done!! YOu have the PERFECT place to make it! Oh I'm so glad that you gave in to the pretties because it's truly beautiful. And, you shared so many unique ideas. I, too, really liked seeing the old sewing drawer made into a ribbon holder. It is fabulous. Oh Isabel, can I go stay with you for a while? I'll pay top dollar to stay in that lovely room!!! Your stash of barkcloth is to die for! If I were to steal anything, it would so be that!!!! I enjoyed my visit to your creative space...thanks for sharing!!!! Okay, my bags are packed and I'm ready to move in! What a gorgeous room! I could just stay there forever! It's gorgeous! I am having a "Christmas in July" giveaway on my blog tomorrow (Sat); would love for you to stop by! WOW...I am in love with all of it...so beautiful. Absolutely gorgeous! And the bed is a treasure. I want to live in that room! Your space is stunning and your needle is magical. Love it all. You have given me some ideas for my master bedroom so I'll be back to linger longer and dream of how to incorporate a few of your ideas. Thanks so much for sharing. Oh Isabel, what a talented lady you are. Sometimes it's really hard mixing that many prints, but you have done it with perfection! I would love to be a guest in that room! 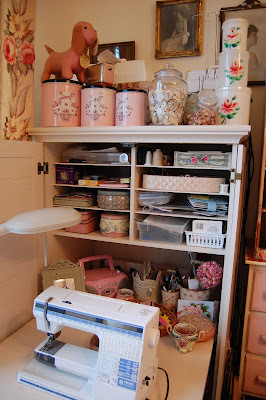 What a perfect place to surround yourself with inspiration while sewing all your wonderful things! Thank you so much for coming to my party. You have really helped make it a great success! Everything is so fantastic! I recently discovered that I just can't "do" pretty.... it just doesn't work out for me. YOU do pretty better than anyone! Love it! I am completely blown away! Oh, the bed, the bed... I want to dress up in hoops and curls and lounge gracefully with bon bons all day long. 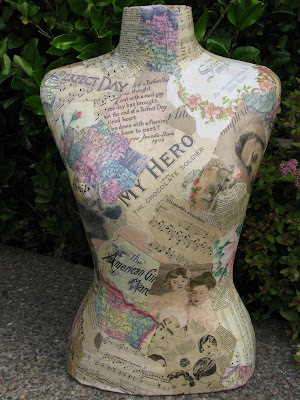 Sigh... My favorite: the mannequin bust! Oh, but how delightfully charming it is. What a beautifully creative space you live in! 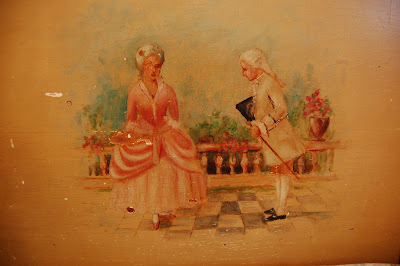 It is a pleasure to make your acquaintance at this lovely event; please do stop by for a visit soon! I love your place. I really adore it.. 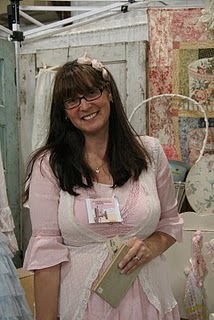 It is what I love too.. Love all the fabric and you are so talented.. So many treasures.. What a great place to make beautiful things. I loved seeing it. Thank you.. Keep creating! I was about to call it a night but decided to visit one more link and here you are!! 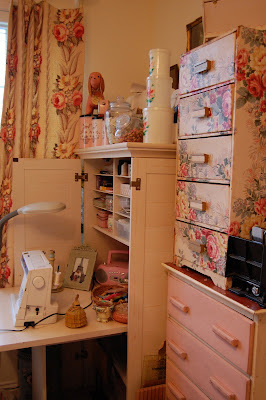 words can not describe how much I love your sewing/bedroom!!! every single thing sings to my heart and soul. I then had to look at your other posts. I only wish we lived closer so I could come over... I'm in AZ. well, I added you to my blog links page. I hope you come visit me and we can become good friends. You're my studio hero! =) Oh the roses... I just adore your room!! Can I live there? And I am head over heels for your lacy umbrella! WHERE did you find that? 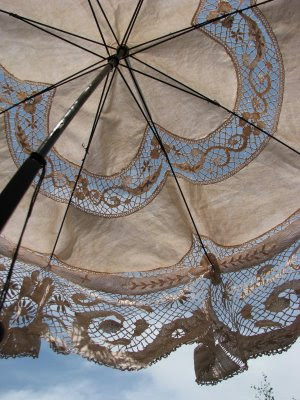 I have a tablecloth that is a similar pattern and have been pondering how to make it into a big ol' umbrella. Thanks so much for sharing your studio. I'm going to bookmark it to show my mom later. Have a beautiful Sunday. Oh my!! 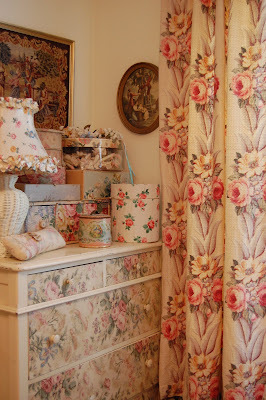 Just fabulous.....I'm a barkcloth collector also...I see the Glen Court design hanging up..it is such a pretty design..I think I have one long panel of it. 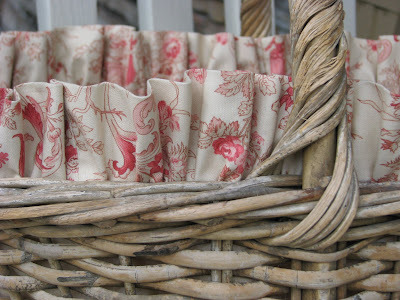 We definitely share the love for vintage fabrics! I can't wait to unpack all of mine again..it's getting close now! Thanks so much for sharing your creative space..it is so lovely!!! Isabel, I absolutely adore your beautiful place to create in - wouldn't it be wonderful to be a guest in your home! I can't get enough of your wonderful creations! It's all so devinely beautiful. 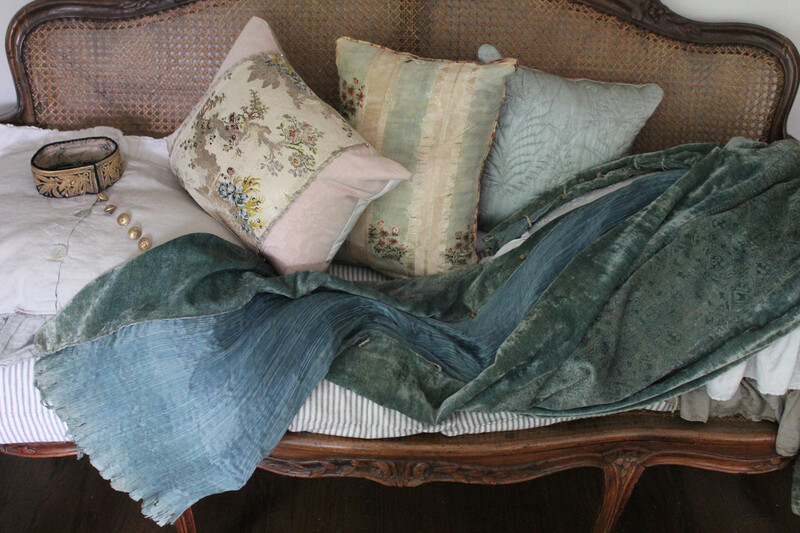 Gorgeous fabrics and prints! That room is much too lovely to be for crafting???? Thanks for sharing. Beautiful! Just Beautiful! 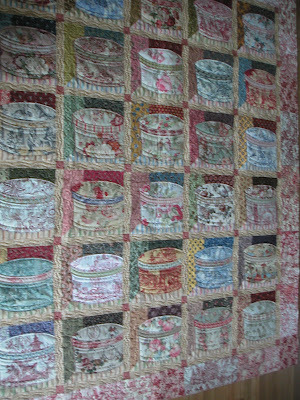 I especially love the quilts! Thanks for such a lovely tour! Your creative space is fabulous! 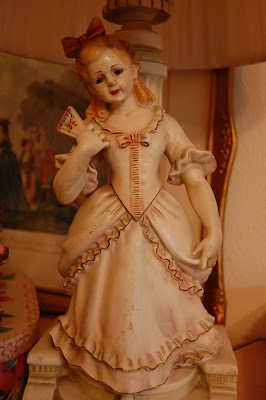 Isabel~ Your creative space is so lovely! I could spend a whole day just going from one pretty spot to another. 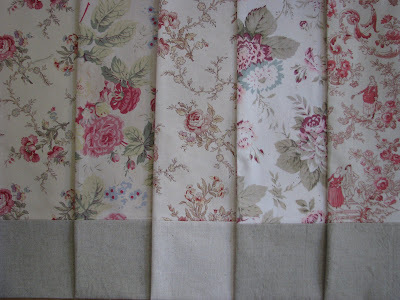 Your fabric collection is Heaven!! 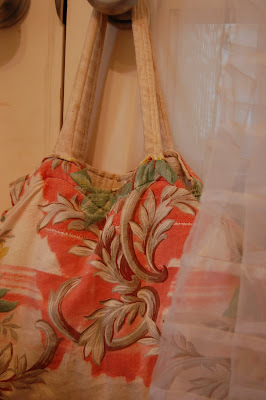 I don't sew much, but love pretty fabric. Wow, so much to love! Beautiful studio. 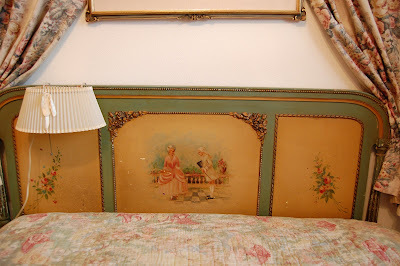 I love that headboard. 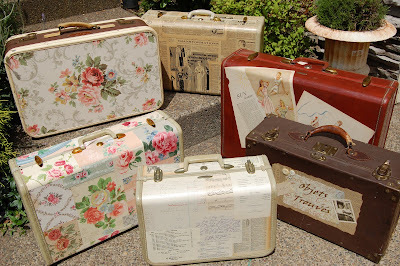 And your creations are wonderful - love the pillows, the teapot lamps, the decoupaged suitcases. You are very talented. Thanks for sharing. wow, your space is AMAZING!!! I am a little late to the party, but better late than never. My daughter, the fashionista, will soon be leaving the nest for her new apartment. 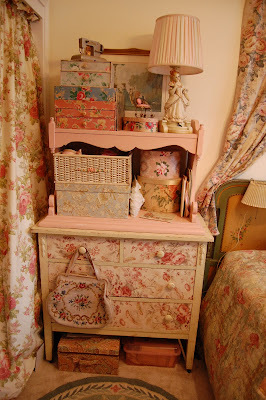 I will have the luxury of decorating her old room (specifically the closet) as my creative space. I cannot wait and will incorporate many of the wonderful ideas you have shared here. Thank you. Amazing! 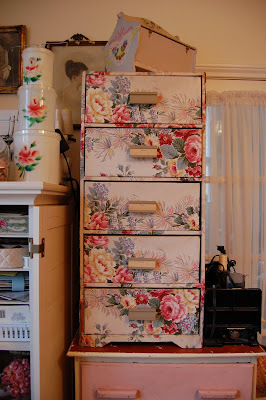 I love all the drawers covered in floral paper. Your quilts and all you have created I love! Thanks for sharing and I will be back. Wow! What a bunch of lovely projects and items. How fun! What a stunning room you have - the headboard on the bed is gorgeous! Your artwork is unbelievable - so much talent! Thank you so much for sharing your space! I still am trying to make my way through Karen's list. So sorry to be late. Your creative space is gorgeous! So full of inspiration and beautiful things to look at. I wouldn't be able to fall asleep there because I would keep repeating 'is this a dream'.